After his middle school appearance in Urasoe City, Koyamada attended the US Navy White Beach Naval Port Facility's annual White Beach Spring Festival where volunteer staff member Mike Hertz showcased his own classic black, convertible Mustang American car at the festival's car show. The Annual White Beach Spring Festival, part of the Commander Fleet Activities in Okinawa, features Dragon Boat Races, 3 on 3 Basketball Tournaments, Car Shows, Static Displays, Entertainment and a Kiddy Land area. Hundreds of local Okinawa residents spend the day at the event. Koyamada next met up with his friend Capt. Richard Weathers, the Commander of the Fleet Activities, who had just finished his Dragon Boat race. Koyamada and Weathers headed to the Static Display area where all kinds of helicopters, tanks, missiles and others related items were on display. Koyamada was impressed and then enjoyed interacting with the troops, learning new things and seeing other Okinawan people enjoying themselves doing the same. 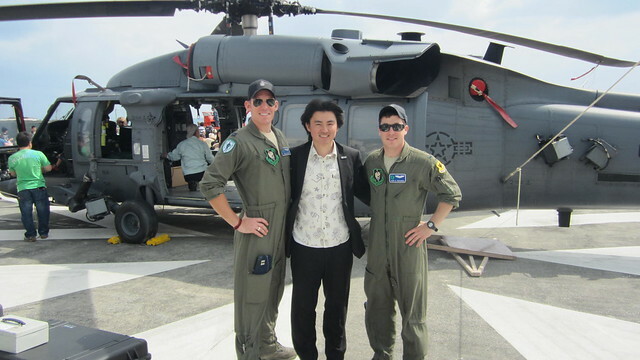 Koyamada thought this open festival was a great place to bring local Okinawan residents and troops together as a way to strengthen the friendship between the US and Japan. He was also very pleased to note the wide age range of American and Japanese people who participated in the events. By interacting and learning from each other, new friendships were made. Koyamada hoped that the festival could continue for many years and as more Japanese participate, the festival could well become an even greater springboard for improving US-Japan relations.